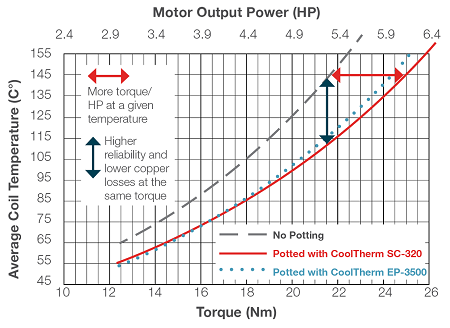 Heat robs a motor of power and shortens its life - LORD CoolTherm® conductive epoxy and silicone encapsulants help manage that heat, which enables you to increase the power density and life of your motor. Our studies have shown a temperature decrease of up to 50°C or an increase in power output up to 30% when using our CoolTherm materials. What’s the best solution for your application? We can help you select the correct material and optimize your process to improve performance and lower costs. With over 40 years of industry expertise and a full product portfolio available, we can help you stick to your schedule and stay on budget with CoolTherm solutions - contact us today! 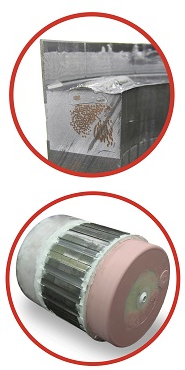 Our encapsulants provide a robust thermal interface between the stator winding and heat sink. They are not only highly thermally conductive but also low in viscosity, enabling them to flow into fine gaps. Furthermore, their high Tg allows for Class H and N ratings with no thermal stress cracks. Increase Power: Get more torque or horsepower from the same size motor, or get the same amount of power from a smaller motor. Extend Life: Keep your motor running at lower temperatures, thereby lengthening its service life.